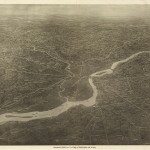 This bird's-eye view map, c. 1926, depicts rivers, roads, and highways linking Philadelphia to the surrounding region of southeastern Pennsylvania and southern New Jersey. Major thoroughfares from the west can be seen intersecting with Market Street in West Philadelphia, while arteries from the east converge in Camden. An indistinct shadow between Camden and Philadelphia suggests construction of the first bridge crossing between the two cities: the Delaware River Bridge, later renamed the Benjamin Franklin Bridge, which opened in 1926. 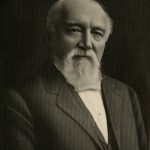 Prominent businessman and civic reformer Rudolph Blankenburg (1843-1918) denounced the profiteering surrounding the Boulevard's construction as political "effrontery and thievery." 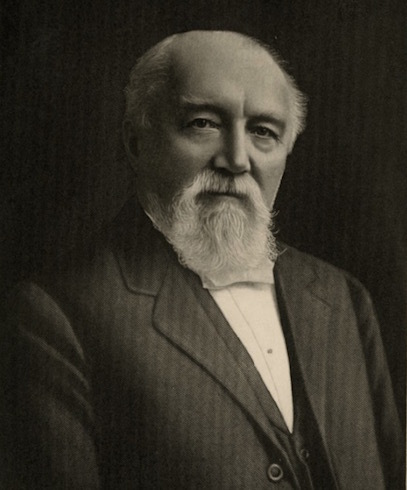 Born in Germany, Blankenburg immigrated to the United States in 1865 and soon settled in Philadelphia, where he worked in importing and manufacturing. He and his wife, Lucretia, both became involved in civic causes. A Republican, Blankenburg nonetheless opposed the Republican Party "Organization" that dominated the city and state during the late nineteenth and early twentieth centuries. His activism on behalf of good government led to his election as mayor for one term, 1912-16, an achievement the New York Times described as "one of the greatest reform campaigns ever fought in this country." He reformed city financial management, established civil service by merit, and stopped ward leaders from collecting assessments from police and elected officials. In a departure from road projects like the Boulevard, Blankenburg advocated public transportation initiatives such as the Broad Street Subway. While serving only one term, he earned a reputation as the "Old War Horse of Reform." 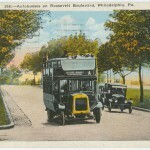 This color postcard, c. 1926, depicts a lightly-trafficked Roosevelt Boulevard in a still-rural area of Northeast Philadelphia. The No. 206 bus is carrying passengers toward the Margaret-Orthodox station of the Market-Frankford El. It shares the road with an automobile, the form of transportation becoming increasingly popular and widespread in the 1920s. The sign at the left is a holdover from horse-and-buggy days. It reads: "Caution. Driving or riding faster than seven (7) miles an hour is prohibited. No vehicle of burden or traffic shall be driven over the boulevard." 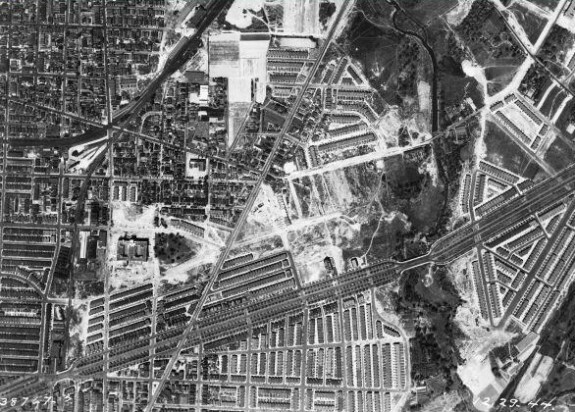 An aerial photograph shows the extent of development in Juniata Park near Roosevelt Boulevard (running diagonally from lower left) and Rising Sun Avenue. The photograph demonstrates the development that occurred in the vicinity of the Boulevard, which became a link in the north-south U.S. 1 interstate highway in 1926. 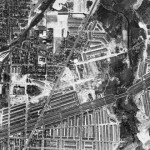 By the 1940s, automobile travel and the growth of suburbs prompted city planners to plot a connection between Roosevelt Boulevard and the new Schuylkill Expressway. 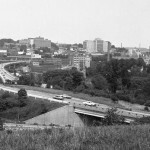 In this 1971 photograph, traffic moves toward the Schuylkill Expressway on the 3.5-mile Roosevelt Expressway, an extension of the Boulevard completed in 1961. The extension bridged the physical separation between two of Philadelphia's major traffic arteries, but it required displacing residents from homes in its path. The result did little to alleviate traffic snarls on the Boulevard. 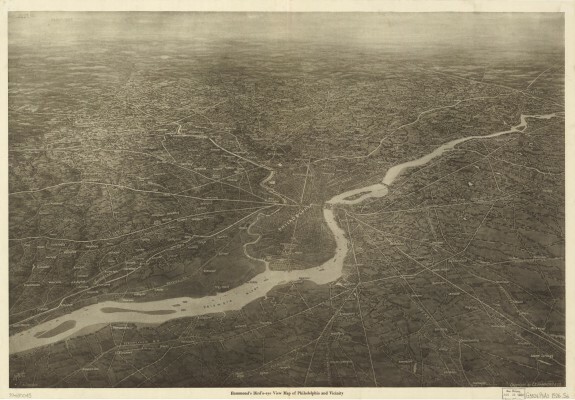 Snaking its way through parts of North and Northeast Philadelphia, the Roosevelt Boulevard, formally known as the Theodore Roosevelt Memorial Boulevard, has become one of the most heavily traveled thoroughfares in the Philadelphia metropolitan region. Initially conceived amid political maelstroms during the “corrupt and contented” phase of Progressive Era Philadelphia, “the Boulevard,” as it became known, evolved in phases and embodied the complicated planning and political factors, especially following World War II, that went into its convoluted and still unsettled development. 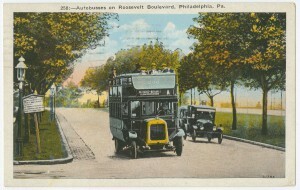 The Boulevard’s history dates to 1902 when, in a bold effort to continue binding the commercial interests of downtown Philadelphia with the largely untrammeled and unoccupied lands of Northeast Philadelphia following the Act of Consolidation (1854), the mayoral administration of Samuel Ashbridge (1848-1906) called for building a modern transportation link to facilitate economic growth and residential opportunities along the proposed corridor. But the incestuous business and political relationships of the Republican Organization, the predominant political machine in Philadelphia, undermined the integrity of the venture from its onset. Designated the “Torresdale Boulevard” at its inception–largely because Torresdale would serve as the roadway’s northeast terminus–the road developed in phases between 1903 and 1914. To forge the much sought-after link between downtown Philadelphia and Torresdale, home to many affluent families who might be enticed to patronize the department stores of downtown Philadelphia, the Philadelphia Department of Streets established a right-of-way from Broad and Cayuga Streets to the Boulevard, which was renamed the Northeast Boulevard—principally because it did not officially extend to Torresdale upon its initial development—by the time of its official opening in 1914. Over the next four years, real estate interests drove the continued expansion of the boulevard toward Pennypack Creek, largely because they sought to capitalize on the burgeoning, and potentially lucrative, housing market in the lower Northeast. The Boulevard underwent one final name change upon the completion of its extension to the Pennypack Creek—making the roadway seven miles long—in 1918, when its principal supporters renamed it the Roosevelt Boulevard, in honor of President Theodore Roosevelt (1858-1919). As federal and state transportation agencies became more involved in the construction of new highways prior to the Second World War, the City of Philadelphia gradually relinquished control of the Boulevard to federal and state highway authorities. The Boulevard therefore slowly grew into part of the nation’s transportation infrastructure. With widespread ownership of automobiles and federal oversight of a nationalized highway system following the Federal Highway Act of 1921, the Boulevard and its surrounding environment flourished in the 1920s with the construction of new commercial facilities, such as the Sears-Roebuck department store and a mixture of row houses and single-family residences. Formally absorbed into the federal interstate highway system in 1926, the Boulevard became part of the newly created U.S. Route 1, a north-south interstate highway stretching from Maine to Florida. Although the Boulevard functioned as one of many vital arteries along U.S. 1, the federal government ceded control over its local, physical maintenance to the Philadelphia Department of Streets and then, in 1937, to the Pennsylvania Department of Highways (later renamed the Pennsylvania Department of Transportation or PennDOT), which became the primary vehicle for initiating construction projects and obtaining funds from the federal government to finance them. Following World War II, the City Planning Commission crafted highway policies in collaboration with state authorities that sought to remedy traffic issues and address residential concerns associated with postwar suburbanization and the entrenchment of an automobile culture. In 1947, the City Planning Commission, acknowledging the effects of the automobile on residential decentralization of the surrounding region, announced its plan to build the Roosevelt Expressway to bridge the physical divide between the existing Roosevelt Boulevard and the planned Schuylkill Expressway. Edmund Bacon (1910-2005), chairman of the Planning Commission, acted as an intermediary between aggrieved residents and state highway authorities over plans to construct the Boulevard Extension through densely populated neighborhoods. In 1950, Bacon met stiff resistance from Germantown residents who loathed the extension proposal and lobbied for the construction of a bypass north of the city to keep their neighborhoods free from the possible overflow of traffic congestion on the Boulevard. Bacon, however, disagreed with critics of the Planning Commission’s highway program, remarking that the bypass would only exacerbate, not alleviate, traffic problems inside city neighborhoods. Although Bacon rejected the residents’ overtures for a bypass to divert traffic around their neighborhood, he nevertheless worked behind the scenes to secure support from the Pennsylvania Department of Highways to minimize the impact of the extension construction on local residents. He convinced the Department of Highways to narrow the lanes on the proposed extension from six to four, which kept 500 residents from being displaced. 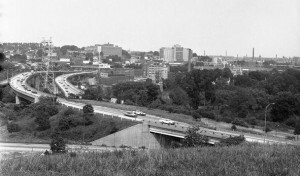 The eventual completion of the 3.5-mile Roosevelt Expressway in 1961, however, did little to ease traffic issues on the Boulevard, eventually compelling the commission to adopt another plan to relieve traffic snarls among the rapidly growing neighborhoods and thoroughfares of Northeast Philadelphia. The alternative remedy to the traffic quagmires on the Boulevard–a proposed Northeast Expressway devised by the City Planning Commission in 1964–met relentless attacks from state officials and Northeast residents. While the Boulevard had been expanded into the Far Northeast to accommodate residential expansion and shopping centers in the late 1950s and early 1960s, the Northeast Expressway proposal would have extended 14.9 miles from Hunting Park in North Philadelphia to Bensalem in Bucks County. An accompanying nine-mile extension of the Broad Street Subway Line also would have expanded public transit options for those living in the Northeast. PennDOT purchased homes along the Boulevard during the early 1970s to make way for the expressway, but many residents and activists in the Near Northeast objected, arguing the extension would disrupt residential life and pollute Tacony Creek Park. PennDOT and Philadelphia city officials scrapped the expressway proposal in the early 1980s, daunted by the economic, political, and social hurdles they would have to overcome. After the demise of the Northeast Expressway proposal, city and state officials attempted repeatedly to improve the quality of transportation and safety along the Roosevelt Boulevard. Attempting to resolve structural problems plaguing the twelve-lane boulevard, in 2003 the City Planning Commission completed the Roosevelt Boulevard Corridor Transportation Investment Study, which explored ways to improve the grading and routing of the Boulevard and called for mass transit alternatives to alleviate traffic. In 2008, the Delaware Valley Regional Planning Commission’s Long-Range Vision for Transit modified some of the ideas in the 2003 study, envisioning, for instance, an extension of the Broad Street Subway and an elevated line along the Boulevard to the Bucks County boundary. Far from a settled issue, the ongoing policy debates about the Boulevard’s development remained not only an outstanding question among city planners and state officials but also reflected the complex, political forces that brought it into existence over a century ago. Kidd, Stephen. Design of Markets: Social Division and the Progressive Design of Northeast Philadelphia, 1900-1960. Ph.D. Diss. , George Washington University, 2002. McCaffery, Peter. When Bosses Ruled Philadelphia: The Emergence of the Republican Machine. University Park, Pa.: Penn State Press, 1993. Records of the Philadelphia City Planning Commission, Department of Public Works, and Department of Streets, Philadelphia City Archives, 3101 Market Street, Philadelphia. Newspapers and Microfilm Center, Free Library of Philadelphia, 1901 Vine Street, Philadelphia. Edmund Bacon Collection, Architectural Archives, University of Pennsylvania, 220 S. Thirty-Fourth Street, Philadelphia. Roosevelt Boulevard, North and Northeast Philadelphia.